When I tell folks that my store is in Poetry, Texas, the resounding reply is "Where?". Poetry is outside of Terrell. It's about halfway between Dallas and Canton. It is beautiful! I have deer in my back yard. Not a lot of traffic. Not too far from anything, but far enough from everything. The history of Poetry can be read here. I came to know of Poetry in the late 90's when my sister and her then husband purchased some land in Poetry. I lived in the city then, and often found myself donning work boots and jeans to head out to the country. It was only a 30 minute drive from where I lived at the time, but it was a world of difference between one place and the other. I moved to Poetry in 2004 and opened Primitiques in Poetry in 2007. 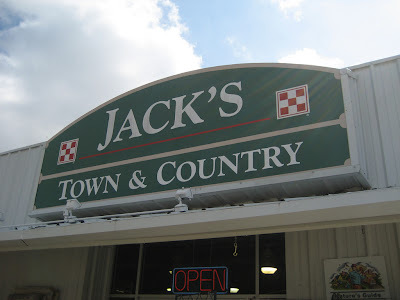 Primitiques is located inside Jack's Town and Country. If you would like to enjoy some photos of Poetry, click here. The photographer, April, happens to be my business partner, Jeannie's niece. Here you will find some wonderful photography in Poetry, by Patrick. April has some pretty pictures. I enjoyed them. I'm sure poetry is a best kept secret. I must come by and see you sometime after all we are awfully close as I am in Sulphur Springs and Canton is for sure one of my favorite places to shop! My favorite thing about Poetry, Texas is you're there! How cool is that! I didn't know that was a town. Now I understand the meaning behind your shop and blog name, duh!